We offer web based services like Web Map Service layers and Geocoders to developers and organisations. We need to associate Web Service requests to Web Host customers for billing purposes. To provide Web Hosts a secure, online service to our Web Services, for their end user Browser applications. A Web Host must be authorized as having access to the Web Service requested. 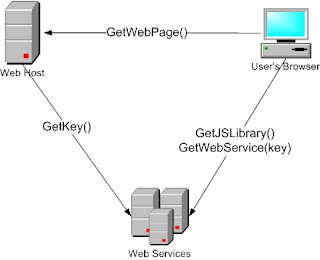 Once authorization is established, the Browser will be allowed use of the Web Service on behalf of the Web Host. The Browser will have access to the Web Service. Authorization must be invisible to the Browser, the authorization is between the Web Host and Web Service. This may require distinction from how the Browser interacts with the Web Service once authorized. The Browser must be informed if authorization fails. Web Service Access levels supported is allow or deny. Tiered level of access is not addressed yet. Access of data and services will be determined by the web service. Here is an excellent interface for viewing maps - even if it has been around for ages. Project the maps on the wall, then move the maps around by stroking the wall with your hands.